NOTE: Date must be in the form YYYY-MM-DD, like 2018-07-03. 2018-07-03 - Union, KY - Photo from KY Department of Fish & Wildlife. 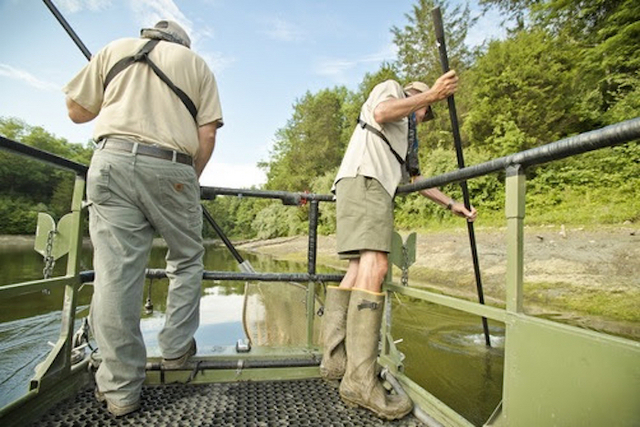 KY F & W team use electrofishing boats to recover fish from Lake at Big Bone Lick State Historic Site. The technique involves applying electrical current to the water, temporarily stunning the fish so they can be netted then released alive. Largemouth bass up to 15 inches, channel catfish up to 18 inches and bluegill were recovered and relocated to 88-acre Benjy Kinman Lake in Henry County. The July Chamber of Commerce luncheon meeting, at Lindsey Wilson College's Roberta Cranmer Dining Center, 430 Helen Flatt Drive, Columbia, KY. at 11:45amCT, Tuesday, July 10, 2018, will feature guest speakers Sabine Eastham, Director of the International Students Program at Lindsey Wilson College, and Denise Fudge, VP of Education Outreach at Lindsey Wilson. - Ellen Zornes, Executive Secretary, Columbia-Adair County Chamber of Commerce. UNION, KY - (Tue 3 Jul 2018) - Helping save fish facing an uncertain future and improving a public fishing opportunity at the same time were all in day's work for a team of fisheries biologists and technicians with the Kentucky Department of Fish and Wildlife Resources on Tuesday, July 3, KY. The department offered its assistance to the Kentucky Department of Parks after the recent discovery of a leaking dam at Big Bone Lick State Historic Site in Boone County. The dam, which does not appear to be in imminent danger of failing, impounds a 9-acre lake. Note - A charge is merely an accusation. A defendant is presumed innocent until and unless proven guilty in a subsequent court of law. Washington County, KY - (Tue 3 Jul 2018) - Trooper Daniel Forbis is investigating an unlawful imprisonment case that occurred today, at 12:15pmET on Coulter Lane in Springfield, KY. He was a Veteran of the United States Air Force, having served during the Vietnam Era and was a carpenter by trade. He will be buried in the Lebanon National Cemetery with full Military Honors by the Marion County Veterans Honor Guard. He had made a profession of faith in Christ and was of the Protestant Faith. Michael Wesley Karnes of Greensburg, KY died Sunday, July 1, 2018 in Louisville at the VA Medical Center. He was 68 years, 6 months and 6 days of age. The funeral service will be conducted Thursday, July 5, 2018 at 11amCT/12noonET in the chapel of the L.R. Petty Funeral Home, 1765 New Columbia Road, Campbellsville, KY with burial to follow in the Lebanon National Cemetery with full Military Honors by the Marion County Veterans Honor Guard. Visitation is after 10amCT/11amET on Thursday at the funeral home. Adair CJE office, Recycling Center, GRAS closed Wed 4 Jul 2018. CPD Ofc Kevin Atwood & ACSO Deputy Brandon Hitch responded to a call at approximately 3:18pmCT, Tuesday, July 3, 2018, that a vehicle that Columbia Police was looking for was in the Creek View Mobile Home Park. Upon their arrival a 2010 Mazda 6 car was located, which had been reported stolen from West Page Street, Columbia, KY, to Officer Josh Brockman on Sunday, June 24, 2018. Wife, 66, pronounced dead at the scene by Meade County coroner. Husband managed to escape with only minor injuries. Brandenburg, KY. (Tue 3 Jul 2018) - Kentucky State Police (KSP) Post 4 Detectives responded to a residential house fire in Meade County Tuesday morning. On July 3, 2018 at approximately 4:32amET, KSP Post 4 received a call from Meade County Dispatch requesting assistance with a residential structure fire at 390 Gaines Farm Road, Brandenburg, KY. He was a store clerk at Napa Auto Parts and a member of White's Chapel Separate Baptist Church. He was born in Somerset, KY, and was a resident of Russell Springs, KY, at the time of his death in the city of his birth. He was a member of a respected family, the son of Mary Lou Conover Ashbrook, who survives, and the late Luther Ashbrook, and the widower of Nellie Hunt Ashbrook. He leaves seven step- living descendants. His final place will be in Freedom Cemetery. Alan Ray Ashbrook, 64, of Russell Springs, KY, died Monday, July 2, 2018 at the Hospice of Lake Cumberland, Jean Waddle Care Center in Somerset, KY.
Funeral service for Alan Ashbrook will be 2pmCT, Thursday, July 5, 2018 at the Bernard Funeral Home chapel, 367 N Main Street, Russell Springs, KY, with Bro. Larry Johnson officiating. Visitation will be 11am-2pmCT, Thursday. Interment in the Freedom Cemetery. Special music will be by the Singing Rexroats. Pallbearers: Josh Collins, Sam Wade, Justin Benningfield, Robbie Billingham, Jacob Keltner, and Ashley Coffey. Columbia, KY (Tue 3 Jul 2018) � Kentucky State Police are asking for the public's assistance in attempting to locate 39 -year-old Shane Wright, of Lebanon, KY. Shane is a 5'10" 286 pounds, white male with brown hair and blue eyes. He was last seen when he checked himself out of Eastern State Hospital in Lexington on June 2, 2017. 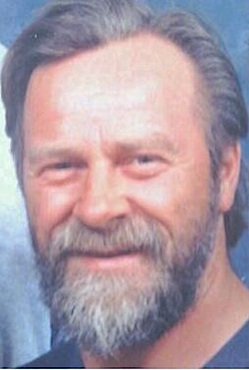 Mr. Wright�s whereabouts are unknown. If anyone has information regarding his whereabouts, please contact the Kentucky State Police, Post 15 at 1-800-222-5555 or your local law enforcement agency. Tpr. Daniel Forbis is investigating. Police in Franklin County are investigating the death of a 3 year old who was found in a hot car on Friday. WLEX-TV reports 3-year-old Calvin Hodges were found Friday in the vehicle. Will Harrod, the county coroner, confirmed the death. The coroner said the boy was pronounced dead shortly before 10 Friday night. An autopsy was performed Saturday. Farmers Market on the Square, NW Corner of Campbellsville & Merchant Streets, Columbia, KY, will be open 12pmNoon-5pmCT, July 4, 2018. There will be lots of fresh vegetables and fruits for all your holiday parties. We hope everyone has a great July 4th - Donna Jones, Farmers Market on the Square. CM note to FM2 vendors: Please email the produce you will have at the Wednesday FM2 to ColumbiaMagazine.com Tuesday evening, July 3, 2018 for publication in tomorrow's listings, using this Contact/Submit, link. Or call 270-250-2730 for help with submissions. On Sunday, July 1, 2018 The Adair County Sheriff's Office responded to a single vehicle accident on Knifley Road. A preliminary investigation determined Samuel Langham, 25, of Knifley, KY, was operating a 2007 Jeep Commander southbound on Knifley Road. Paving work will extend eastward from Metcalfe/Adair County line to MP 43 on Cumberland/LBN Parkway. SOMERSET, KY (Tue 3 Jul 2018) - The Kentucky Transportation Cabinet (KYTC) District 8 Office advises motorists that beginning Monday, July 9, crews will begin performing paving operations on the Cumberland Parkway in Adair County. J.O.Y. Ministries sends a big thank you to our community and to Hotprints for supporting the Paz-Holley project via a barbeque this past Friday. We made over $2000, leaving us 60% of the way towards our goal of $108,000. CAMPBELLSVILLE, KY - Campbellsville University's online master of marriage and family therapy program has been ranked in the top 25 different programs in the nation by Online Psychology Degrees and is the only Kentucky school on the list. CU was ranked because of her affordability, accreditation, specialized coursework, experiential learning opportunities and flexibility options. SOMERSET, KY (Mon 2 Jul 2018) - The Kentucky Transportation Cabinet Department of Highways District 8 brought home its third state championship from the 2018 statewide Equipment Roadeo held June 26-27 at the Kentucky Horse Park in Lexington. The following vendors will/are at the Adair Farmers Market, 6am-10amCT, today, at the Adair County Extension Office, 409 Fairground Street, Columbia, KY.
D & D Longview Farms. Gradyville, KY. Danny, 270-250-3701 & Danny Burris, 270-250-1277. Gradyville, KY with TOMATOES. New Potatoes. Green Beans. Yellow Squash. Cucumbers. Zucchini, Blueberries. Black Berries. Kelvin Riley, 812-498-4937, Gradyville, KY Tomatoes, green & yellow. Roma II Green Beans. Cucumbers. Potatoes. Raspberries. --Robert Stone, Tuesday, 3 July 2018. 2018 open Tuesdays and Fridays, 6am-10amCT, 409 Fairground Street. (Tue & Fri 6am-10amCT). Casey County Judicial Center, 231 Courthouse Square, Liberty, KY. One (1) Court Event(s) Circuit Court. Twenty-five (25) Event(s) District Court. Taylor County, Justice Center, 300 E. Main Street, Campbellsville, KY. One (1) Event(s) in Circuit Court. Two (2) Court Event(s) District Court.